When we hear the word “disease”, chances are we don’t bother about it that much anymore due to our advanced medical technology at the moment. But what about extremely rare and mysterious conditions that pop out of nowhere and have no specified treatment options? 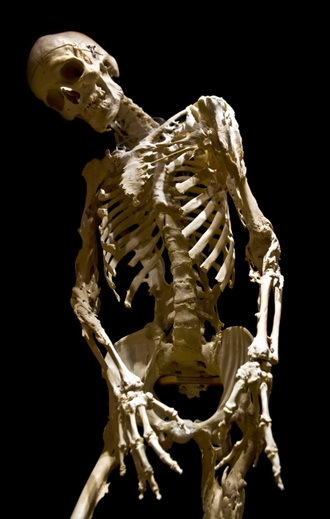 Stone Man Syndrome or fibrodysplasia ossificans progressiva (FOP) sounds more like the title of a song or a fictional character created by a fiction writer. Nevertheless, this medical condition is a real (though extremely rare) disorder, which literally turns its host into bones. This extraordinary medical anomaly, which was first described by John Freke, a surgeon at London’s St. Bartholomew Hospital in 1736, slowly replaces the patient's muscle and connective tissues, ligaments, and tendons with bones. Because of ossification, these tissues and body parts basically become bones on top of the body's skeletal system or extra-skeletal bone. Considering the placement of ossified tissues, the patient is rendered immobile by this disease. FOP can already be detected during an early childhood stage of the patient. The disease starts developing from the neck down to the limbs. Because of its very rare nature, the medical anomaly has still been studied by medical researchers until today. Only around 3,300 people have been known to have this disease all over the world today. The best physical evidence of this disease can be found in the Mütter Museum located in Philadelphia. It is the skeleton of Harry Raymond Eastlack (in the photo). When he was just a 5-year-old boy, Eastlack fractured his leg. Not long after, it was discovered that his thigh muscles were being replaced by bones. The bony growth continued developing to the point that all his vertebrae had been joined together by it. Harry Raymond Eastlack, however, did not die because of this disease. He died of pneumonia just 4 days before he turned 40 years old. At the time of his death, his entire body was affected by the disease, even his jaw. Eastlack made a pact with the museum, where his skeleton remains to this day, to give his body to them after his death. The museum has been keeping Eastlack's remains since his death in 1973. One tell-tale sign of stone man syndrome can be seen during birth. It is characterized by an abnormally formed big toe. Aside from this, shorter thumbs at birth may also be a possible tell-tale sign of the disease. According to a recent breakthrough in medical research, the disease is the result of a mutated gene ACVR1. In normal conditions, this gene controls the production of transmembrane, a protein on the surface of a cell. When mutated, though, this gene becomes sensitive to the presence of another protein, activin A, which makes it to function in an agitated manner instead of being controlled and relaxed.